D’ATMOSFERA - A pochi passi da Piazza Venezia, nel centro di Roma, sorge il Ristorante La Cabana. Un ambiente cordiale e molto accogliente, caratterizzato da un arredamento particolare e rustico, con i mattoncini a vista sul soffitto e sulle pareti a rendere il tutto più caratteristico. 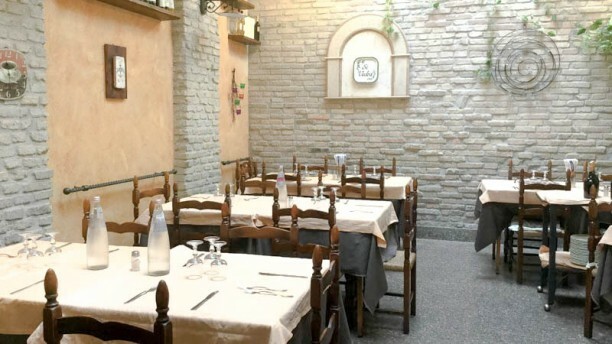 LA CUCINA - Il menù del locale è molto ampio ed è ricco di specialità mediterranee, sia a base di carne sia di pesce. Inoltre, sono disponibili squisiti piatti della tradizione romana e regionale, tutti sicuramente da provare. CANTINA - La carta dei vini della struttura dispone di un’ottima selezione di etichette, in particolare provenienti dal territorio toscano. The food, service, and management were absolutely wonderful. A local recommended we eat there to celebrate a birthday. They all made our celebration special in Rome special. It is a fantastic place with tasty food. If you want to try the best carbonara and Aperol - visit La Cabana! Service is 10/10, prices are not high. At the heart of Rome. Nice place and fine meal. This was one of the best experiences we have had in a restaurant in Rome. The food was excellent the service was top notch. We will be back for another wonderful experience. Massimo was a GREAT waiter. Excellent service. The service, food and pricing were wonderful! I can’t say enough about how well we were treated. The special was sea bass and it melted in your mouth. We had 1 waiter taking care of our group of 15 without and issue. We never waited for a thing and he was always checking up on us. Will go there again whenever in the area!!!!!!! Pasta to write home about. Get the fettuccine with bacon and squash blossoms. This was our second visit to LaCabana and it did not disappoint. We had a large party of 9 and everyone thought it was one of the best meals we had in Rome...would definitely go again! Local cuisine at a restaurant in existence for decades, with tremendous service. Excellent! Portion tiny. Mediocre pasta. Undercooked. Really a tourist restaurant. No locals. Nice food. Tasty rossito and juicy beef steak. Though the waiter forgot the seafood salad, everything else is really fantastic. It seems to be a local restaurant since many local residents visited this restaurant for more than once. Have eaten here a dozen times in the past, always given rave reviews to an outstanding diner experience. This time, waiter forgot one of food orders, two errors on wine order, had to be reminded several times about water order. Amateur hour. Food excellent as always, everyone happy at the end, but simply bafflingly poor service.